The programme for the talks is posted. Please check the Program tab. Cosmological simulations (Illustris, EAGLE, FIRE) indicate that the ISM and its constituents are important to understand galaxy formation but are poorly constrained. The discrepancy between observations and simulations is because the roles and physics of the above-mentioned processes are not well understood. 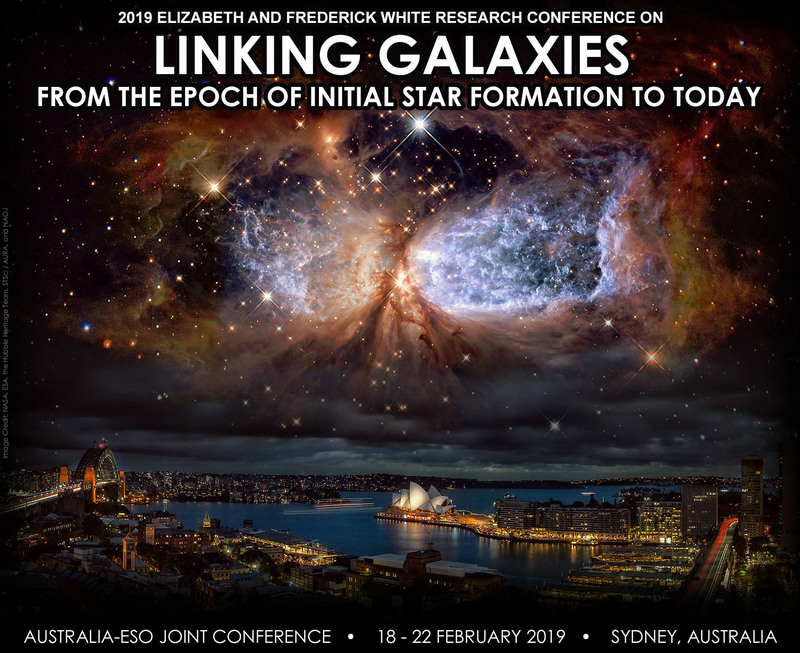 Defining synergies between Australia and other ESO communities to follow up existing and planned optical and radio surveys to maximise impact and establish a better understanding of galaxy formation and evolution. Defining questions for simulators to test and improve their simulations. Encouraging interactions and collaborations between observers, theorist, and simulators internationally. The five day conference will be at the Rydges World Square Conference Centre at 389 Pitt Street, Sydney, NSW, 2000. See the tabs above for a list of childcare facilities, accommodation, and visa requirements. There will some funding support available for students. For more information, feel free to contact the Conference Local Organising Committee at esoaus_loc@aao.gov.au. It is required that all participants at this conference abide by a Code of Conduct. By registering for this workshop you acknowledge that you have read this code of conduct and will respect it. Anyone who wishes to report a violation of this policy is asked to speak confidentially to one of the meeting organisers. Registration is open from 21st August 2018 and closes on 4th January 2019. Payment of the registration fee (A$410) will be by invoice, to be issued after registration is submitted. The registration fee includes morning and afternoon coffee breaks, lunches, the cocktail reception (17th February 2019, Sunday evening), and a gift. The conference dinner fee will be charged separately. There are limited funds available towards childcare and student conference fee registration concession. Please indicate in your registration if you would like to take advantage of these. The deadline for submitting an abstract for a talk is 3rd December 2018. Abstracts for posters are accepted until Registration closes on 4th January 2019. Registration closed on the 4th January 2019. The conference programme is available now. For the poster sparklers, 2 min for each presentation are allocated. You can either present the poster as it is or make 2-3 slides. The posters will be hung all five days of the conference to provide the maximum amount of discussions. We have heard of some scam emails related to accommodation booking. We are not providing any hotel packages. Please check when you sign up for hotels and find accommodation of your choice. It is located in Sydney's Central Business District (CBD) and is accessible by all transport modalities including car, bus, train, and shuttle. 3 train stations (Town Hall, Museum & Central stations) are only a short 10 minute walk and there are many main bus routes along Oxford, Elizabeth & George streets. The conference location is remarkable, a city block packed with trendy shops and many varieties of restaurants and bars. The location offers easy access to Sydney attractions such as Haymarket and Chinatown, the Queen Victoria Building and Pitt Street Mall, Darling Harbour, and the iconic Sydney Harbour foreshore. The conference will be in the main auditorium, the "Grand Ballroom" that accomodates 500 people (see site layout at the bottom), and there are adjacent smaller rooms (ballrooms 1 to 3) that each accomodate over 100 people. There are state of the art audiovisual facilities. Sydney Airport is located just 13 minutes by train from the city. Airport Link offers a fast and convenient way to reach the conference venue with trains running approximately every 10 minutes. The train station is located at the northern end of the Sydney Airport international terminal and is accessible from the Arrivals level; the train also stops at the domestic airport terminal. Exit the train at Town Hall station, or Museum station, then see the attached map for the 10 minute walk to Rydges World Square. It is necessary to purchase an Opal Card from the station. For more information, including fares, maps, timetables and travel planners, see transportnsw.info. Transportnsw.info allows you enter your origin, destination and departure/or arrival time, and provides street and walking maps that show exact bus/train stop locations. A taxi from Sydney Airport to Rydges World Square costs about $49; after 10 pm the price increases to around $56. For locals driving with their own cars, Rydges World Square offers valet parking at a flat rate of $60.00 per day. The welcome reception will be held on 17th February 2019 at the Rydges World Square Conference Center, "The Cidery Bar and Kitchen”, 5:00-8:00 pm. The reception is covered in the registration fee. Please check the "Getting there" tab for more information to find the venue. The guests are not covered. If you would like to bring guests to this event, please let the LOC know at esoaus_loc@aao.gov.au. Extra $30 will be charged per additional guest. The conference dinner will be on the evening of Thursday the 21st of February (7:00 pm-10:30 pm) and will be held in the center of Sydney at Doltone House (Level 3, 181 Elizabeth Street, Sydney), overlooking the beautiful Hyde Park. The dinner fee is $100. If you bring an extra guest, there will be a charge of an extra $100 for each guest. For attendees needing childcare services, we recommend the World Tower Child Care facility as it is located at the conference venue and offers a 24-hour care. The service is an occasional care service and Australians can benefit from the Department of Human Services Child Care Subsidy (CCS). Inclusions each day are 5 chef-prepared meals, nappies, and wipes, linen and sunscreen. All that is required for children to bring each day is a small bag with a change of clothes, a hat, and jacket for outdoor play times. Personal items such as bottles, formula, dummy, and sleeping comforters may also be brought in if necessary. If you are selecting your child to attend the care facility, please fill out the enrollment form attached at the bottom. A copy of each child's birth certificate/passport and immunisation history statement will also be required for enrolment. All documentation can be sent to Natalie Debes (natalie@worldtowerchildcare.com.au) when you are ready. Please refer the conference in your correspondence to benefit from regular rates rather than casual rates. For international attendees, the conference will provide some daily subsidy to assist towards the cost. Funding is limited and on a first-come, first served basis! All travellers to Australia must have a valid visa before boarding their plane. Participants require either a eVisitor (subclass 651) or an Electronic Travel Authority (subclass 601) visa or a Visitor Visa (subclass 600). You can use the Visit Australia website of the Australian Government to help you decide the visa you need for entering Australia. The eVisitor (subclass 651) visa is free and it is available for short (up to 3 months) visits or for business visitor purposes. Participants must apply for it at least 2 weeks before traveling to Australia and must have a passport of certain countries (including Austria, France, Germany, Greece, Ireland, Italy, The Netherlands, Poland, Portugal, Spain, Sweden, Switzerland, and the U.K.). Please check the details of your case in the eVisitor (subclass 651) visa webpage. The a Electronic Travel Authority (ETA, subclass 601) visa costs 20 AUD and it is available for short (up to 3 months) visits or for business visitor purposes. Participants must apply for it at least 2 weeks before traveling to Australia and must have a passport of certain countries (including Austria, Canada, France, Germany, Greece, Ireland, Italy, Japan, Malaysia, Portugal, Singapore, South Korea, Spain, Sweden, Switzerland, the U.K. and the U.S.A.). Please check the details of your case in a the Electronic Travel Authority (ETA, subclass 601) visa webpage. The Visitor Visa (subclass 600) visa costs 135-340 AUD and it is available for short (up to 3 months) visits or for business visitor purposes. Depending on nationalities, participants must apply for it at least 2 months before traveling to Australia. A passport holder of any country other than the ones mentioned above could apply for this visa class. Please check the details of your case in the Visitor Visa (subclass 600) visa webpage. Conference participants who are not eligible to apply for an eVisitor or ETA visa need to request a "Letter of Invitation" to supplement their application. Please email esoaus_loc@aao.gov.au if you need an invitation letter or any further information.